The Age of Steam – The Coming of The Super Sentinel! 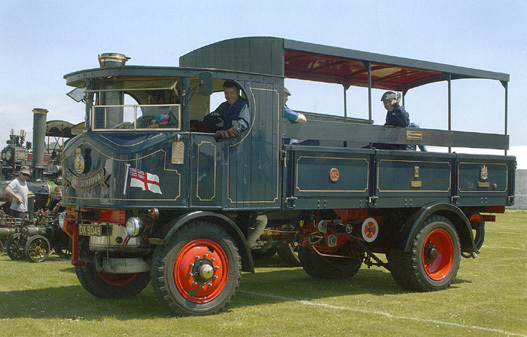 If you have never driven a steam lorry a hundred and thirty miles then you obviously have not lived. On the other hand, if you have, then you are lucky to be alive, as we found it a pretty alarming experience to the uninitiated, although one’s driving license cheerfully states that the bearer is entitled to drive a heavy locomotive ‘. We are still alive. We found her (She has not been christened yet but she is patently a female both in temperament and in the way she wasted coal) in a field near Maidstone As we coasted down into a quiet rural Kentish valley, we saw below us a field in which steam tractors and lorries stood, like a herd of giant iron age cows, all whisping steam as they ruminated in the June sun. As we approached we found there were engines of every conceivable size and type— from an ancient fire engine to a giant brass-bedecked fair engine which sat regally in its stall. She sat on the edge of the field, hissing contentedly, while a black mechanic had a final fiddle with her feed check. Her owner rolled up in a 1960 Bentley, changed into his overalls and within minutes was as black as the mechanic. We dutifully changed into our virgin-white ones and within minutes we were as black as the mechanic as well——we do not recommend steam lorries to the fastidious. Steam was raised again (open damper. turn on the funnel blower, four shovelfuls down the chute—"watch your eyebrows mate!" and we went for a trial trot round the paddock. It was soon apparent that she was a little odd to drive— to turn the large forged steering wheel was like opening a stiff main stop without a wheel spanner. The throttle was an unlagged handle conveniently situated near the main steam pipe so that the driver’s hand was uniformly overheated (we became blasé eventually and worked it with an Oily rag, but this, though a sound insulator, had the quaint habit of jamming the throttle in a position opposite to which was required). The brakes were steam operated and. if you forgot to warm them through (i.e. your second sight was out of action), took at least ten long seconds before they jammed the rear wheels solid, and finally if all else failed there was a hand brake quite suitable for any giant who liked pulling levers. So we set off, smoke curling over the Kent countryside, two of’ us in the cab and the third in the Land Rover while, behind, the Bentley purred with the owner anxious at the wheel. 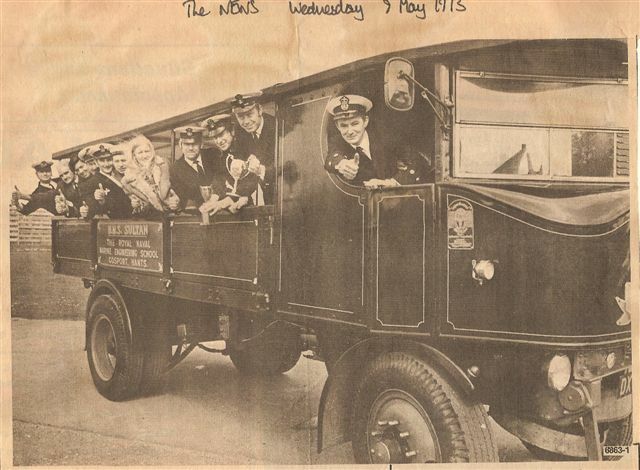 The crew of a steam lorry we then discovered, must co-operate and be friends otherwise all is lost. For the stoker not only has to avoid putting coals down the driver’s neck but also has to keep an eye on the level in the boiler (open engine driven feed pump by-pass if too high and to remember that putting coal down the open chute (take lid off first when the engine is coasting down hill (i.e. no exhaust up the spout) is liable to be embarrassing both to him and the driver, as the cab is then filled with smoke, some coal dust, hot air and soot which does not help accurate navigation, nor to keep one’s hair on in an emergency. The driver on the other hand must not use all the precious steam his stoker has sweated to make, but has to adjust his throttle to keep the pressure on the 200 mark—and avoiding the cardinal sin of all steam lorry drivers of ‘ blowing soot ‘—as had as lifting safety valves on a Sunday morning in Grand Harbour. After five miles we stopped (intentionally), and had a final briefing from the now happier owner, and started (intentionally on our journey on our own. Apart from the more immediate personal problems within the cab, it was also apparent that our progress on the traffic-strewn a roads presented a few further problems to our fellow ICE motorists. As our driving confidence grew, so our speed increased. (except for the hills) until twenty miles of countryside would have slipped by if we could have kept going for another hour. But one of the minor snags of a steam engine with no condenser is that it has a monumental thirst. We carried 150 gallons of water in a tank at the back, which at (subsonic) speeds greater than 15 m.p.h. was down to a dangerously low level after a quarter of an hour. The problem therefore was to find, in advance, suitable water-holes. The latter would appear at first, to be simple in a rural country littered with merry rivers and babbling brooks. but we quickly discovered that England’s road makers seemed to have taken the utmost pains to avoid all sources of high humidity. We also discovered that modern garage owners require a certain amount of humoring before they would allow a vehicle which oozed flame and fire to fill up with 150 gallons of water while it stood over their underground petrol tanks. However, we managed to find the odd stream and even, at one stage, a village pond where a family of swans objected strongly to the ground being sucked from under their feet as it were. At one garage we had two hoses one ran from the ladies lavatory, the other from the gents. Filling other than by pressure hose was achieved by a special steam injector fitted on the tank, which not only sucked up water but any passing minnow and gash which happened to be in the vicinity. That night disaster struck us—after forty confident miles we eventually lost the water from the gauge glass, and hastily had to pull into a deserted garage, where she disgorged her fire. Like some ancient mythical dragon, onto the deck. We waited anxiously for the roar of escaping steam and water as the fusible plug melted but nothing happened, so we quickly revived our gloomy spirits with some ale, and turned into a roadside café alongside several other lorry drivers (ICE). Our arrival, like some visiting black minstrel trio, caused a slight stir in the place. Next morning we found the garage no longer deserted but full of vintage mechanics, all of whom seemed to know all the answers on steam driven lorries. They fussed and fretted over her, and one even obliged by loading up with tarred wooden blocks which, he said rather sadly, was all that remained of Chatham High Street. They repacked the feed pump gland (which had been in trouble the night before) and by 10 a.m. we were on our way west again, this time in the pouring rain—a hazard we had not appreciated in the bright day before, for not only were the roads greasy but visibility from the cab was poor on account of we had no steam driven windscreen wiper!. At Reigate traffic lights these hazards were brought home to us for on the downhill approach to the lights at red, it was clear that the brakes were inadequate and the Highway Code was going to be seriously flouted. Furthermore three lorries waiting at the lights were patiently going to need some pretty urgent repair work. Luckily there was just room to pass them, so that they where slightly annoyed and alarmed when seven tons of impatient steam lorry hurtled hooting by with a black stoker leaning out of’ the cab yelling ‘Get out of the way ‘. A small car in our path froze in its tracks and rapidly took avoiding action, and tension was, for the moment, high. But that maneuver succeeded, and for the first and only time, we overtook another moving vehicle. This turned out to be the only occasion when we were an actual menace to life, limb and property, and was, perhaps, a salutary lesson on the potential destructive power in our hands. From then on, like Ahab, we drove delicately, and treated hills and traffic lights with more respect. Thirty miles from home disaster again struck the water once more disappeared mysteriously out of the gauge glass and stubbornly refused to return. Tension mounted, and HMS SULTAN suddenly seemed to recede into inaccessibility. We exchanged black looks and experienced that desperate feeling which comes to all engineers when something goes gravely wrong (usually when entering harbour) and there is no remedy. Nor was there any garage lull of steam lorry experts anywhere within range. The minutes, miles and yards ticked ominously by, and still the gauge glass remained obstinately clear. And then better judgment was scarified in the interests of our goal and all it promised - foaming tankards, a hot bath and the satisfaction of having got there. So we forced on and fed the boiler with a mixture of prayers, coal and Chatham High Street. We made it… You can see her today if ever you visit Sultan. But even on the last few yards we nearly failed - for a zealous LMEM on the gate, who was evidently not accustomed to steam lorries disturbing his watch, and was most reluctant to allow us through on to Sultan’s sacred soil. He was very nearly our only victim. A veteran of the age of steam returned in triumph yesterday to its base at HMS SULTAN, Gosport, after scoring a resounding success in its first national rally at Brighton. 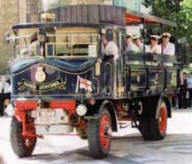 Forty three years old, the 75 bhp Super Sentinel steam wagon is manned and maintained by a team of navy volunteers. After a complete overhaul during the winter the wagon took part in a London to Brighton run, and gained top prize for steam wagons for the whole of the country. It was also runner up for the Concours d’Elegance trophy for which 190 vehicles competed. Lt Chris king RN of Greenwood Close, Fareham, was in charge for the run and was also responsible for the organisation last year, when the wagon attended 26 events for charity and covered 2500 miles. Months of dedication and hard work at the Gosport Naval base HM.S. 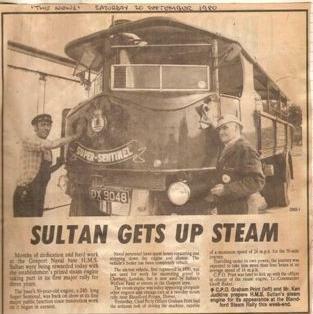 Sultan were being rewarded today with the establishment s prized steam engine taking part in its first major rally for three years. The base’s 50-year-old engine, a 24ft. 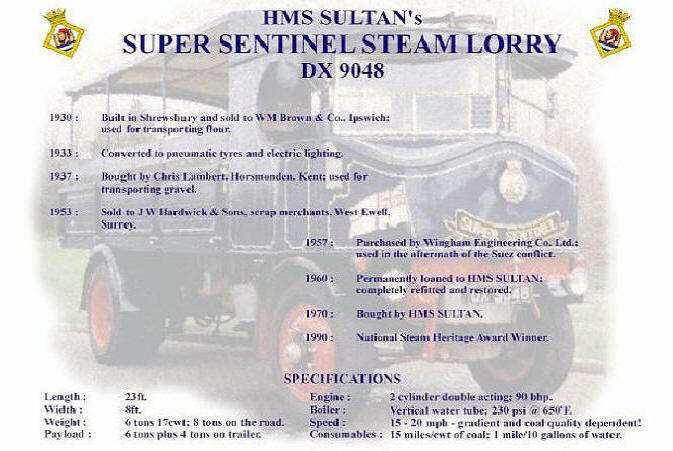 long Super Sentinel, was back on show at its first major public function since restoration Work on it began in earnest. Naval personnel have spent hours repainting and stripping down the engine and chassis. The vehicle’s boiler has been completely rebuilt. 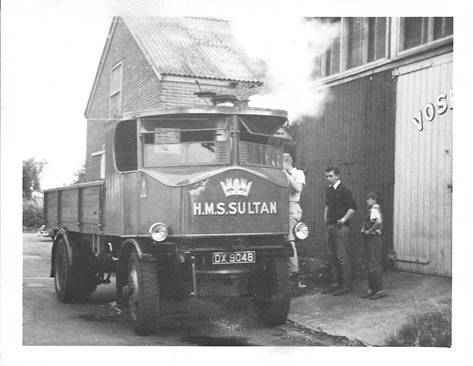 The six-ton vehicle, first registered in 1930, was last used for work for excavating gravel in Chertsey London, but is now used by Sultan’s Welfare Fund at events in the Gosport area. The steam engine was today appearing alongside other engines and vintage cars at a two-day steam rally near Blandford Forum Dorset. Yesterday, Chief Petty Officer Graham Print had the arduous task of driving the machine, capable of a maximum speed of 24 mph. for the 70-mile journey. Travelling under its own power the journey was expected to take him more than four hours at an average speed of 18 mph. CPO Print was later to link up with the officer in charge of the steam engine, Lt.-Commander Geoff Baker. • C.P.O. Graham Print (left) and Mr. Ken Judkins prepare H.M.S. Sultan’s steam engine for its appearance at the Blandford Steam Rally this week-end. Still owned by the Royal Navy, she maintained and run by a volunteer crew of Service Personnel, Ex-Service Personnel and Civilians, at her home on the HM Naval Base HMS Sultan.